INCRA Precision Marking Rules. 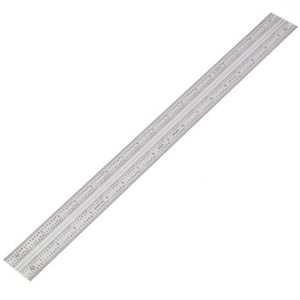 At first glance you might think you are looking at an ordinary ruler. But look closer and you will see micro-fine marking holes and slots every 1/16", 1/32" and 1/64" to instantly locate a sharp pencil point or scribe EXACTLY where you want it. No more squinting as you try to line up your pencil on that blur of lines along the edge of your old steel rule. Even when the lighting is less than perfect, you can effortlessly place your mark precisely on target with zero uncertainty, zero parallax and zero eye strain. Who would have thought there was so much room for improvement in the common ruler. There WAS and INCRA RULES is it! Available in 3", 6", 12" and 18" lengths. Engraved stainless steel. Micro-fine marking holes and slots at every 1/16", 1/32" and 1/64" instantly locate a sharp pencil point or scribe EXACTLY where you want it. Common ruler?...NO. Common sense?... Yes! The INCRA Bend Rule is precisely what you need for layout and measurement along the edge of a board or other work piece. We've put micro-fine marking holes at every scale line to instantly locate your sharp pencil point or scribe exactly on target with zero uncertainty and no eye strain! The 90° shape holds it snugly in place while the two scale surfaces let you mark and measure on the top, edge and corners simultaneously! There are even two vertical end scales for drawing precision parallel lines relative to the edge of your work. Precise, versatile, and easy-to-use are the words which best describe the Incra Precision Marking T-Rule. Think of it as a combination square for marking or measuring that's simultaneously set to every scale position with perfect, instant accuracy. 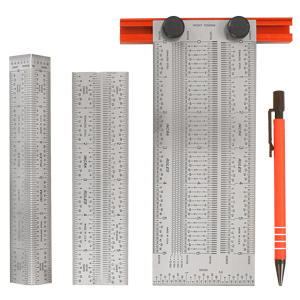 There are micro-fine marking holes and slots at every 1/16-, 1/32-, and 1/64-inch scale position to instantly locate your sharp pencil or scribe exactly on target with zero uncertainty. The Incra T-Rule makes it very easy to draw exact lines in either direction, and with zero uncertainty and no eye strain. 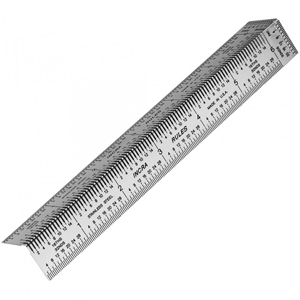 Other features include 0- to 3-inch height markings on the end in 32nds, and the option of marking holes every 1/100-inch. These sets represent the ultimate in layout versatility! The INCRA Pro Rule Sets include not only a Marking Rule and Bend Rule, but the standard T-Rule is also upgraded to the Pro T-Rule. In addition to INCRA's patented marking holes at every 1/16”, 1/32”, and 1/64”, the Pro T-Rules go two steps beyond our standard T-Rules by including marking holes at an incredible 1/100” (0.010”) spacing and also a metric scale with marking holes on 0.5mm spacing. Available in 6”/150mm or 12”/300mm lengths, and an INCRA 0.5mm precision mechanical pencil is FREE in each set. 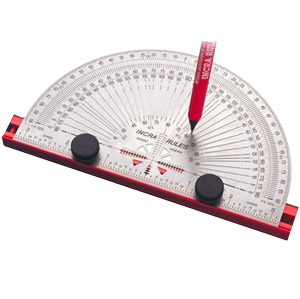 The Incra 6-Inch Precision Marking Protractor lets you plot any angle with ease and absolute accuracy. A metal T-Bar and see-through cross hairs provide perfect alignment against the edge of your work-piece. 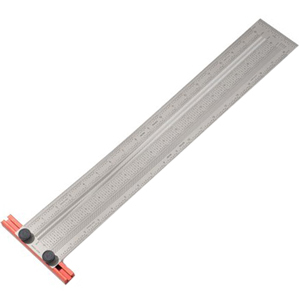 Remove the T-Bar to work on flat surfaces or to use the 6-inch centering scale with micro-fine marking holes at every 1/32 inches. 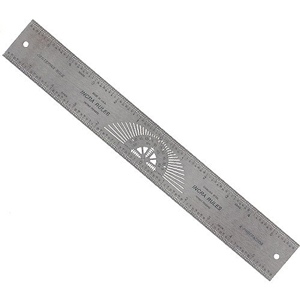 This marking protractor has micro-fine guide holes at every 45-, 30-, 22.5-, 5-, 1-, and 0.5-degree intervals. Four angle scales, including one for marking narrow stock, suit every need. Its easy on the eyes, incredibly accurate, and just plain fun to use.